Kids, anything really is possible these days if you dream it. For example, these days you can get paid thousands of dollars to drink beer, or you could even make a living cutting fancy ham. Just ask Florencio Sanchidrián, who was working as a waiter in a Barcelona kitchen 30 years ago, when their in-house ham cutter got sick. His manager asked him to step in. 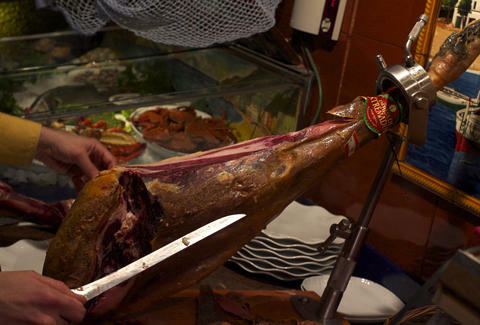 He started slicing that jamon like a duck in sodium-rich water. After Sanchidrián found his calling, he never looked back. Three decades later, and the Spaniard -- referred to by the New York Times as a "rock star of ham" -- is charging upwards of $4,000 just to cut a single leg, and he's done it for Oscar winners (Robert De Niro), presidents (Obama), and even royalty (the king of Spain). Sanchidrián not only rakes in big bucks cutting ham, the job offers some other great perks like visiting other countries. "I travel the world attending events where I can educate people about Iberian ham -- one of the four gastronomic jewels of cuisine alongside truffles, caviar, and foie gras," he told Munchies. Does it seem absurd that someone could be that much better than everyone else at cutting ham? In Sanchidrián's own words: "I've now got a slice that will taste nothing like a normal cut and will in fact remind me that God exists." And since he has literally cut ham for the Pope before, we're going to have to trust him on this one.